Pop Quiz is a unique school collection! This collection is so versatile! 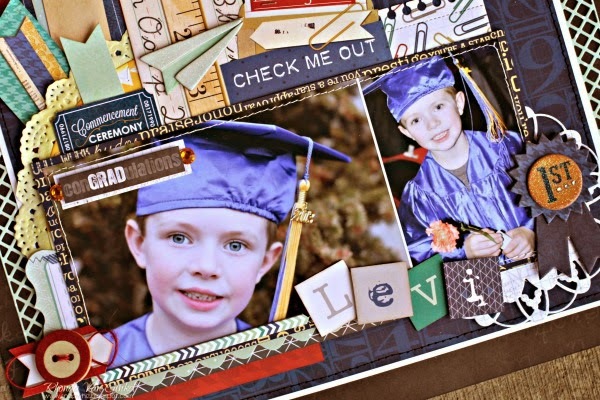 Our design team shows us today that this collection works for non school layouts, senior year photos, grade school photos, and even kindergarten photos! I often tend to go for feminine, romantic and shabby chic collections, but every once in a while I can't resist to also give a more grungy style a try. 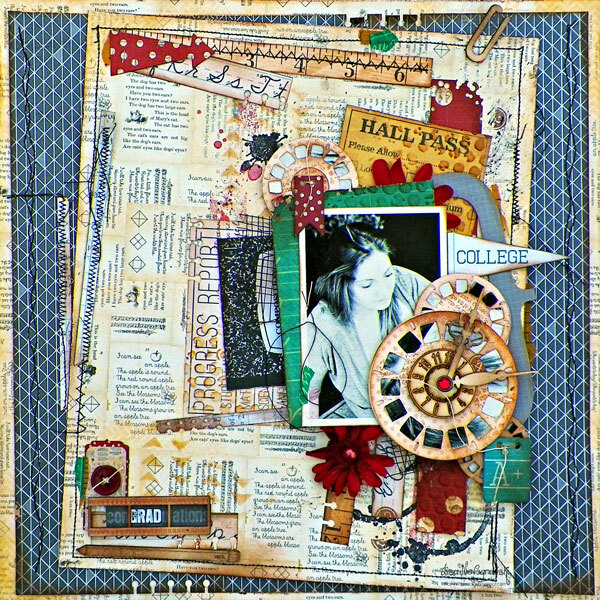 As soon as I saw the Pop Quiz collection, I knew I wanted to use it to make a more masculine lay-out with lots of stamping, distressing and neutral colours. This collection is so beautiful and versatile and because of its wonderful color scheme it will match almost all of your photos. I mixed up the Pop Quiz collection with some items from the beautiful kraft collection. The burlap trim in the left lower corner is from the kraft collection, as are the wood embellishments. Designer Tip: The brown music note 'paper' is actually a kraft gift bag from this collection. I found that it made a nice way to hide my journaling on my lay-out and included a little note inside of it. 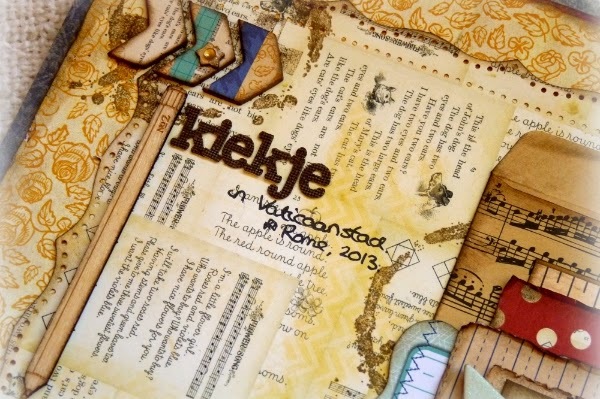 Stamping is a great way to give your lay-out a grungy touch. 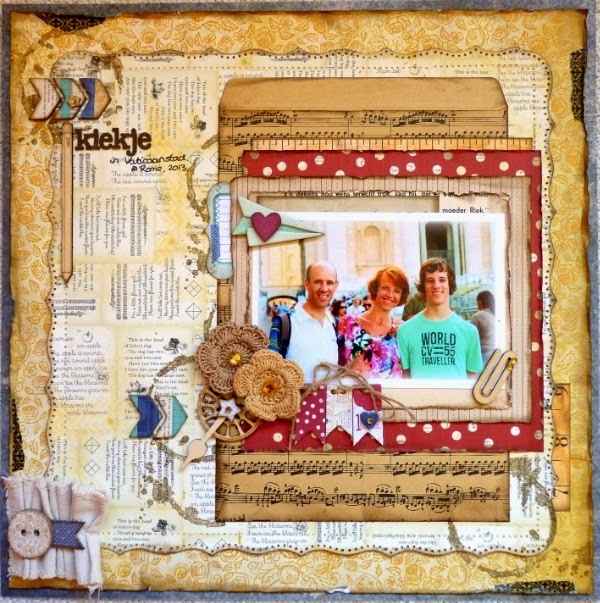 On this lay-out I used my favourite texture stamps: the 'Stained Textures' stamps. I stamped them with brown ink on a few random places on my background paper. 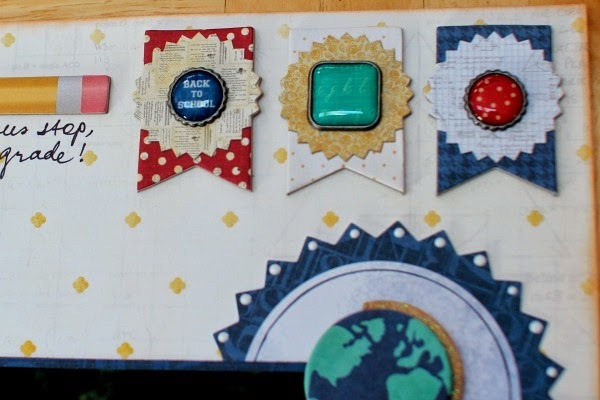 I also added a few small strips of washi tape alongside the borders of the yellow paper. 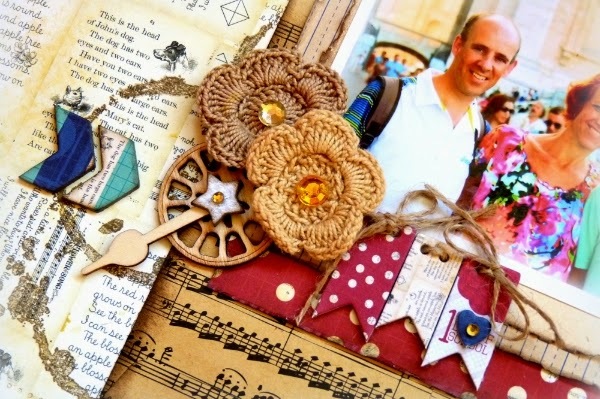 I used two crocheted flowers, chipboard embellishments and wood elements to further embellish my lay-out. To make the chipboard pieces stand out more I accentuated their edges with brown ink. Pop Quiz is such a fun collection to work with! I love collage style layouts and this collection lends itself perfectly for that. This is one of my older daughters senior photos. I love this shot of her especially in the black and white. I was so happy to have a collection perfectly suited to her senior year in High School. I used a honey color distress ink to ink the edges of papers and do some stenciling on the page. Lots of machine stitching around the edges as well. I thought it would be fun to do some embossing just in a few select spots on the "Progress Report and Hall Pass" cards layered within the background. 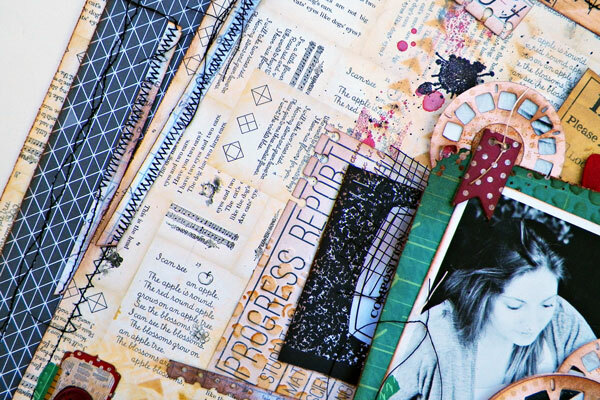 I like to add interest to my pages by layering stamps, stencils, mists, splatters and stitching. You can see here all the texture and interesting dimension this adds to a page. I really fell in love with this collection. I'm always on the lookout for back to school papers, since I like to take pics of my daughter on the first day of school, at school functions, etc. 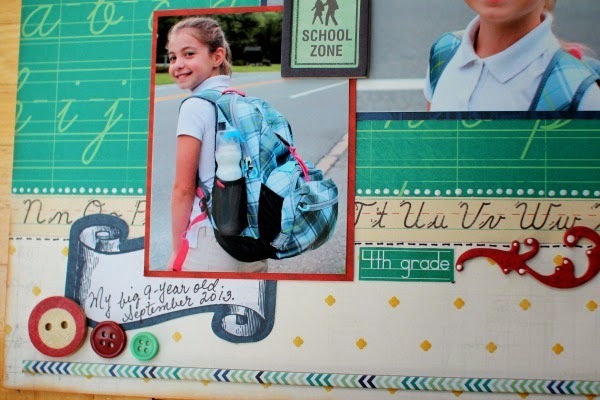 And this collection was really perfect for this - it has lots of school-themed patterns, and can go in either a modern or vintage direction, and the colors are absolutely gorgeous. Very rich and colorful. So I was thrilled to get to scrap with it, since I still haven't gotten to my daughter's first day of 4th grade pics! Shame on me! 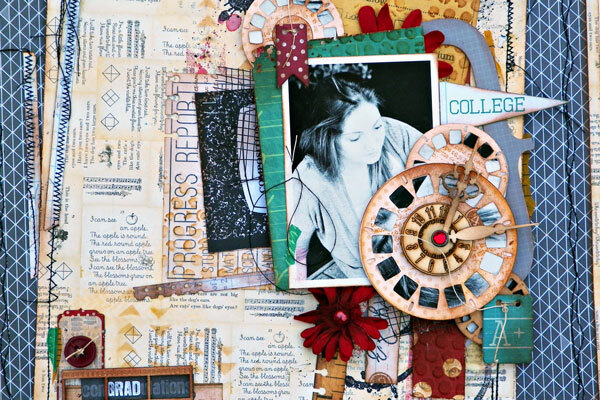 I loved the chipboard, and die-cut, and brads, and buttons that went with this collection. They really help to add some dimension and interest to the page. I also inked the edges of the layout, added enamel liquid dots in various places, and hand-drawn stitching to accent some of the edges. My daughter liked how it came out, so this page is a winner for me! 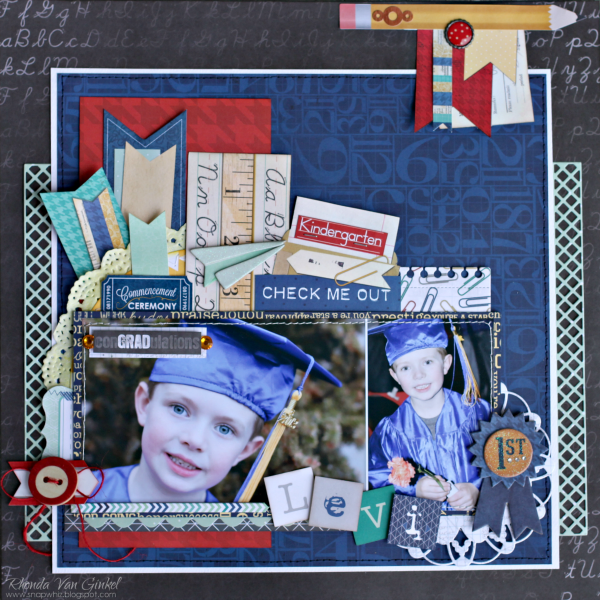 Pop Quiz is such a fun collection full of vibrant colors and perfect for those school or sports photos! I love that it is elegant yet fun and playful all at the same time. 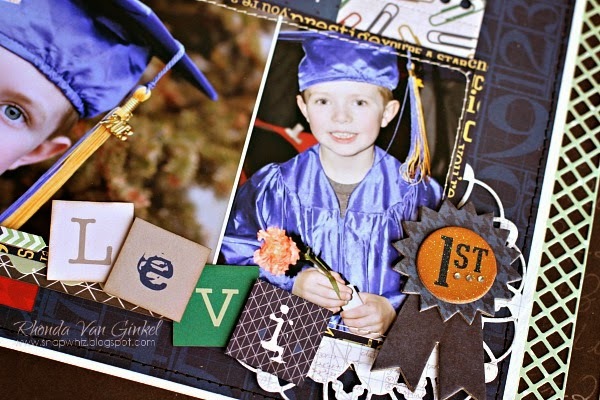 The preschool photos that I have of our oldest were perfect to use with the collection. The doily here is misted with some lemon glimmer mist. I've used the Class Clown paper and cut apart the alpha's to help create some of my title work. The 12x12 Chipboard strip was trimmed to fit. The paper airplane was perfect as my son adores paper airplanes! We would love to see what you create with this collection! Please share with us on our Facebook wall! I hope we've inspired you to scrap some of those fun school photos you have today. I just love how you all used this wonderful collection differently! Amazing lay-outs! I agree, awesome layouts. And I too love how we managed to hit all types of ways to scrap with this paper, from college to kindergarten, to non-school! Love your layout of your daughter, Ilene! I'd like to get my hands on that collection as well to scrap my kids' schoolpictures as well. My daughter Morgan (yes, that is the same name) would love that. Thank you, Carin! Morgan is the best name ever, isn't it ;) Have fun scrapping! Such fabulous layouts! Love all the different styles with the same collection!! !